I've been meaning to pick up an flieger strap for a couple of years now. 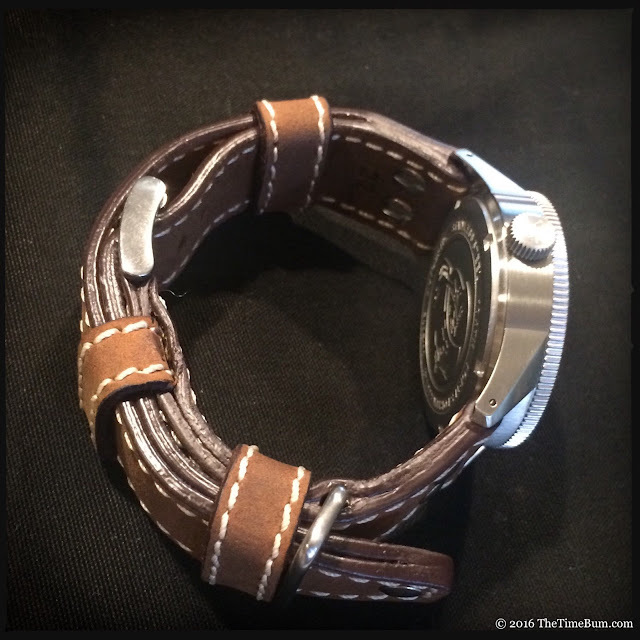 I've owned several pilot straps with rivets at the lugs, and the IWC style that "step down" instead of tapering, but I had not tried a true replica of the original flieger strap. Luftwaffe fliegers, if you recall, were 55mm monsters that were worn outside a flight jacket, requiring strong, secure, extra long straps. 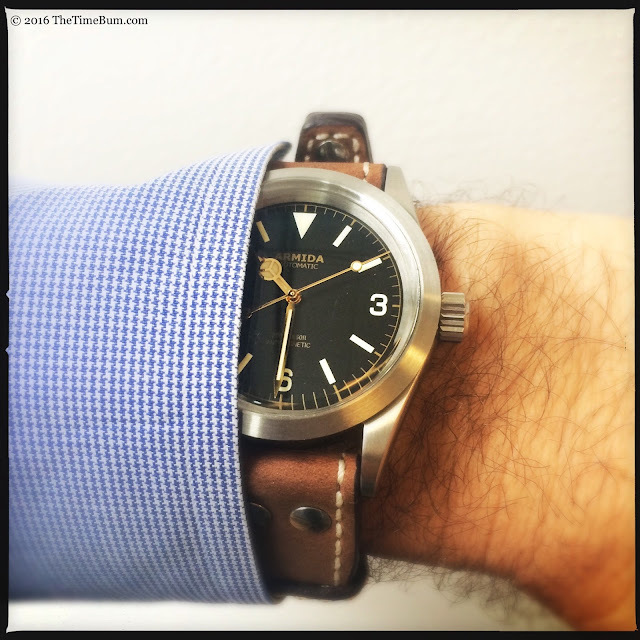 The RIOS 1931Aviator is one such example, and when NATO Strap Company started selling them for just $58.99 (and up to 30% off with multiple purchases), I knew it was time for a review. NATO Strap Company (now more than just NATOs) offers eleven different models of the Aviator in 20 or 22mm widths, all with polished hardware. 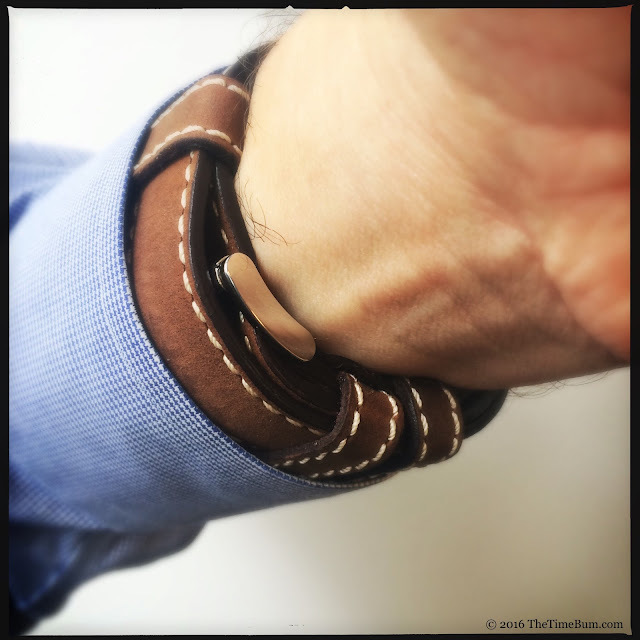 I chose a 22mm model XI in brown suede and white stitching. 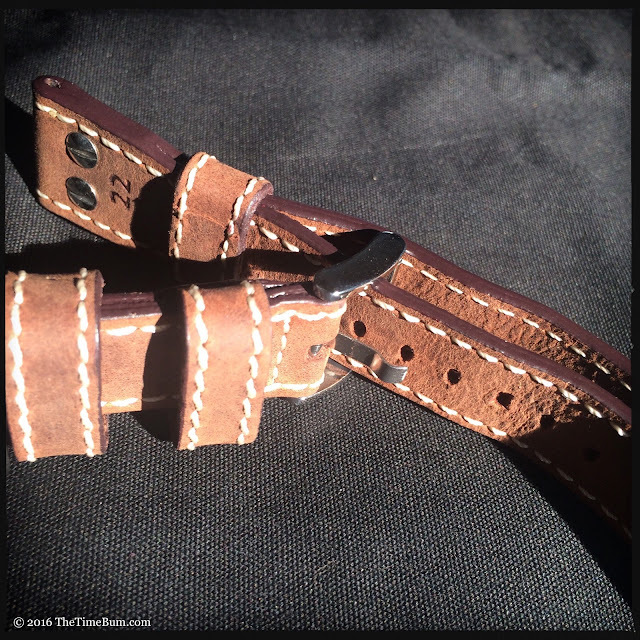 The edges are finished and the strap does not taper. 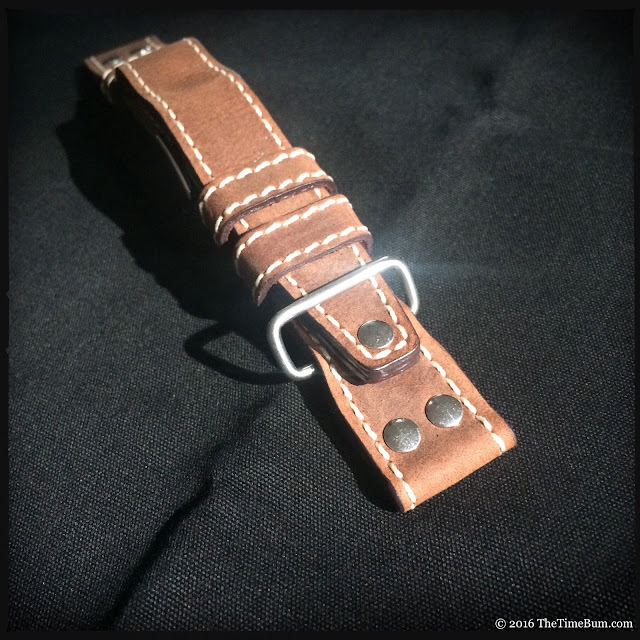 Like all RIOS 1931 straps, it is handmade in Germany to a very high standard. The Aviator is a riveted leather strap measuring 82/154mm, which means the tail is a good 20-30mm longer than average. That tail features a closed loop design where two layers are fastened at the lug end and the tip, with the buckle threaded through the bottom layer, trapping it in the tail so the two sections of the strap cannot be separated. It is not all that complicated, but I did have to fiddle with it for a moment before I understood how it worked. It's really quite easy. 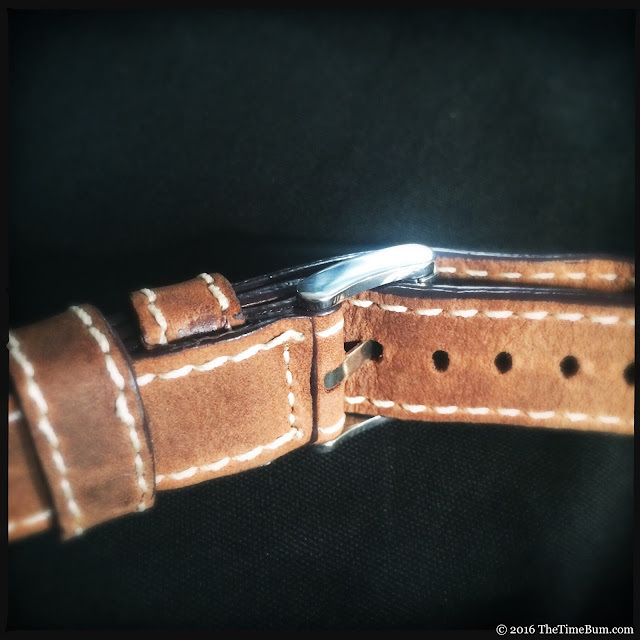 Unbuckle the strap to give yourself some slack and fit the strap to the watch head with spring bars. Back in the day, the screw rivets would have secured the free tabs at the ends of the straps after they had been fed through fixed lug bars, but now they are largely decorative. 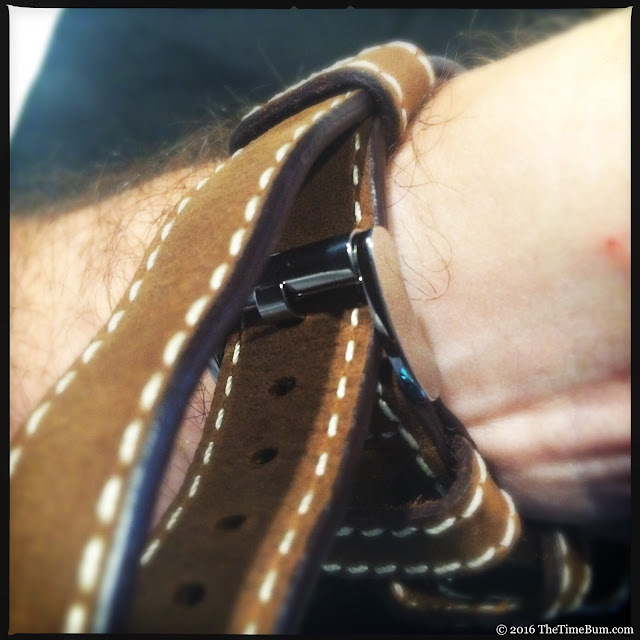 You adjust it the same way you would a conventional two-piece bucked strap, then tuck the excess through one fixed lether keeper, one floating leather keeper, and one steel loop at the very end. (The fixed leather keeper at the top of the tail end is only there for looks.) Trust me, it just looks complicated, but it's actually quite simple. Once in place, you can appreciate the utility of the design. You have a wide range of adjustment and it certainly looks secure, although truth be told, you are still relying on the integrity of those spring bars more than anything else. The downside is the thickness. Remember, these were intended to go over clothing and stay put in arial combat, not tuck neatly under your buttoned shirt cuff at brunch. The Aviator is about 4mm thick through its length, but a full 5mm at the spring bar, so make sure you have ample clearance. It was impossible to squeeze it onto my G.Gerlach Navigator, and difficult to fit it on a Lew & Huey Phantom without significant rubbing, but the long lugs on the Armida A6 swallowed it with ease. "That's very nice," you say, "but does it fit over a flight suit?" Well, I don't actually own one, so I gave it a try on a lined leather jacket. Then I tried a motorcycle jacket. Then a lighter weight leather. Then a denim jacket. No luck. The stap is 9" long. Add about 2" for a common 42mm watch head and you've got an 11" circumference. That sounds huge until you try to stuff it over outerwear. Anything more than a windbreaker or an elastic cuff will be too much. Might I suggest short sleeves?